These fifteen acres, settled in the late 1800’s by Europeans of Finnish origin, include nine acres of second growth fir, cedar and maple plus six acres of fields and orchards. The little yellow farmhouse was built in 1903, the same year as the barn, which is on the Washington State Historic Register. We continue to uncover the history of the inhabitants who came to this land before our family found our way here. It is important for us to keep this rural, agricultural parcel intact and in doing so, honor those families and communities who came before us. We have numerous resources that we are working with including on-going conversations with local residents who have lived in this area for decades and the local, tribal communities. We are continuing to utilize public documents, historical publications and the local museum collections (Suquamish Museum, Poulsbo Historical Society and the Maritime Museum) in our on-going research. One visit in particular to the Poulsbo Historical Society shed insight on a family heirloom. The side-by-side photo below shows the antique Hanson Scale we inherited from our Iowa family farm (left) and the one on display in the museum. The Native Land website provides a searchable list of first nations lands. We are using this as a physical guide as we continue to better understand those who came before us and their history here on this land. The European/Finnish presence here is traceable through public documents and via letters from Gene Thompson, the grandson of Gabriel and Margarita Kokko, the Finnish family who homesteaded this property. "I thought you might like to know the history of my family farm which you've just purchased. My grandfather, Gabriel Kokko and his wife, Margarita, immigrated to the northwest from Finland by way of Wyoming in the 1890s. They settled on this government homestead farm in the early 1900s. Originally, it was 40 acres, but 25 acres was sold many decades ago. They cleared the land, built the main house and barn in 1903. The small cabin and other buildings were built in the following years. Gabriel and Margarita raised six children on the farm. Gabriel was on the school board and was a haberdashery salesman, in addition to being a farmer with specialty chickens and eggs. There were three large chicken houses that held over 1,000 chickens at one point. The family transported the eggs and chickens to the public market in Seattle during the early part of the century. The family Finnish sauna was down by the old pasture well. On Friday, they burned firewood to heat the rocks and poured on water to create the sauna steam. Friday night, the women and children enjoyed the sauna, with the children sitting on the lower bench where it was not quite so hot. Then, on Saturday nights, the men would enjoy the sun and then go into the cooling room, slap their skin with birch branches, then cool down with the cold well water or roll in the snow. The men usually follow this by returning to the sauna and drinking some homemade brew or hard cider. I spent a lot of my childhood on the farm, enjoying the farm animals, adventures with my Uncle Otto and the wonderful hugs and baking from my grandma margarita, so the farm has always been very special to me and holds many good memories. Eventually, the farm was left to my uncle, Otto Kokko, and I inherited it from him and rented it for years. There is a path winding to the north through the forest and part of the farm; it's peaceful and beautiful there too." 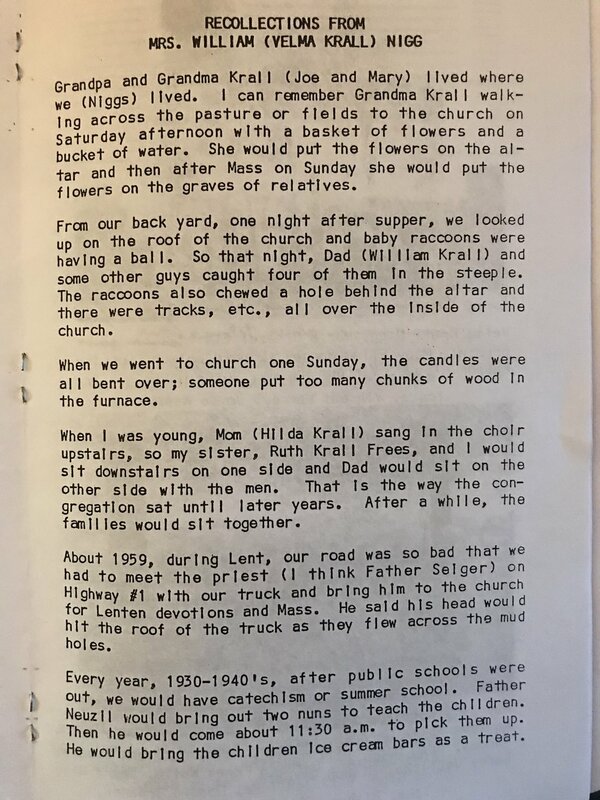 A piece written by Stacy’s Great Aunt, Velma Nigg, which includes Stacy’s Great Grandparents (Krall) and which illustrates the important role that place, including St. Mary’s Church in Newport, held for her family. Our family (Kelsey Marshall, Stacy Marshall/Williams) has lived in Kitsap County since 2001. Our love of the Pacific Northwest began when we left our hometown of Iowa City, Iowa in 1996 after graduating from the University of Iowa. Having lived a life deeply rooted in agriculture and growing up with parents who were passionate about, and proficient with, growing and hunting their own food, Stacy lived "farm-to-table" and "field-to-table" as a way of life. The root cellar and basement were always full of beautifully canned and preserved produce, enough to last through the Winter. Stacy’s mother, Janet Chalupa (Frees) was born and raised on her family’s homesteaded land in Newport Township in Johnson County, Iowa (Iowa City). Janet’s maternal grandparents had immigrated to Iowa from Czechoslovakia where they settled this land along with numerous other families from “Bohemia.” Here, multiple generations contributed to the small scale farming effort where, for close to 100 years, cattle, pigs, chickens and ducks contributed the family income, and to the table. After retiring from a life of farming, Stacy’s maternal grandfather, Robert Frees, owned and operated Bob’s Feed & Hatchery in Iowa City. Stacy has fond memories of Springtime at the hatchery, when boxes full of chicks and ducklings would arrive. As lovers of food and beverage and with a passion for social justice, we launched our first business, Grounds for Change Coffee Roastery, in 2003. Through this small, family-owned business, we have maintained a commitment to a sustainable approach to business that is evidenced by the history, affiliations, B-Corporation status and certifications. In 2013, our family launched Owen's Playground, and collaborated with community to build an inclusive, barrier free, nature-inspired playground in memory of our oldest son. The playground is located at Rotary Park on Bainbridge Island in Washington State; the creativity and beauty of the space illustrates our passion for play, inclusion and the outdoors.